Management on the Mend: The Healthcare Executive Guide to System Transformation, a book published by the ThedaCare Center for Healthcare Value, has earned the esteemed Shingo Research and Professional Publication Award. Management on the Mend is written by renowned healthcare leader and Center CEO John S. Toussaint, MD, who has written two other books—On the Mend: Revolutionizing Healthcare to Save Lives and Transform the Industry and Potent Medicine: The Collaborative Cure for Healthcare. Dr. Toussaint explains the need for leadership involvement that drives a revolution in management by process—an alternative to the traditional top-down approach most healthcare organizations use. 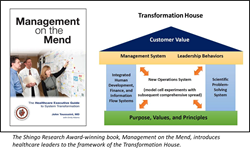 The book introduces the concept of a “Transformation House,” which breaks out key management system elements by their functions and how they interact with and support each other. The foundation of cultural transformation, for example, is its underlying Purpose, Values and Principles. These create the strong, stable base from which to build upon and develop a management approach. The Shingo award is given annually by The Shingo Prize for Operational Excellence, a not-for-profit organization that is part of the Jon M. Huntsman School of Business at Utah State University. It recognizes a book’s contribution to increasing overall operational excellence. The Shingo Prize for Operational Excellence promotes excellence in organizations through application of universally accepted principles of operational systems and seeks to empower people and transform organizational culture. Dr. Toussaint was presented with the award at the Annual Shingo Prize Awards Gala during the International Conference, April 25-29, 2016, Washington, DC. For details about Management on the Mend, visit ManagementontheMend.org. Dr. Toussaint is one of the foremost figures in the adoption of management by process principles in healthcare. Under his leadership, the Center has launched peer-to-peer learning networks, developed in-depth workshops, and created many products – including books, DVDs and webinars. Dr. Toussaint has written three books, all of which have received the prestigious Shingo Research and Publication Award. He also has been published in The Wall Street Journal, Health Affairs, Modern Healthcare and The Harvard Business Review, among others, and is the winner of ACHE’s 2014 Dean Conley Award for his article “A Management, Leadership and Board Road Map to Transforming Care for Patients,” published in the Spring 2013 issue of Frontiers of Health Services Management. The ThedaCare Center for Healthcare Value is an education institute that believes we must have three essential elements for sustainable change in healthcare: Delivery of care designed around the patient; payment and incentives based upon value and outcomes; and transparency of performance (quality and cost) throughout the healthcare system. Founded in 2008 and headquartered in Appleton, Wisconsin, we are a not for profit with a big mission to help change the healthcare industry. Learn more at: createvalue.org.